BURLINGAME, Calif., U.S. — Guittard Chocolate Company, as part of its Cultivate Better sustainability platform, has expanded its flavor quality work in Ghana, Ivory Coast and Indonesia. The expansion is an initiative designed to protect and preserve the unique flavors of each country’s cocoa. With the support of The World Cocoa Foundation, USAID, Swisscontact and the Millennium Challenge Account, Guittard is leading comprehensive programs in the world’s top cocoa producing countries, working with breeders, extension agents, cooperatives and farmers. It takes flavorful, high-quality beans to make great-tasting chocolate, and no one knows this better than the fourth and fifth generation of Guittards who are in charge of this 151-year-old premium chocolate company. The flavor labs are part of an effort designed to address the negative implications of what Gary Guittard terms the “incremental degradation” of cocoa flavor. This incremental degradation is the result of an industry-wide shift toward breeding cocoa for high yields and disease resistance without any consideration for flavor. Recognizing the need to be competitive in the cocoa market, the flavor labs allow researchers in their respective countries to develop the tools and skills to objectively assess the flavor of different cocoa varieties and incorporate this basic and critical component into their breeding programs together with productivity. Guittard notes that most cocoa farmers have not tasted the chocolate that is made from their beans, nor have they had the opportunity to taste the differences among the varieties of their country’s cocoa or the results when harvesting, fermentation, drying and storage are done correctly and when they are not. The program works with cocoa farmers, cooperatives and extension agents to “learn by tasting” how their skill and craftsmanship can build value and strengthen customer relationships. Policymakers are learning to appreciate the differences in the flavor of their country’s cocoa varieties, regional flavor differences and to understand why it is important to protect historical flavor profiles to safeguard market position as well as create new market opportunities. The flavor labs and sensory panel training are part of the company’s larger sustainability mission that balances prioritizing flavor, quality and value with substantial investments in education and training to improve farmer livelihoods. Through the USAID/WCF Africa Cocoa Initiative, Guittard has helped train a cocoa sensory panel at the Cocoa Research Institute of Ghana (CRIG) to identify and preserve the rich chocolate flavor of Ghana cocoa in their breeding program and pre- and post-harvest practices. These skills have allowed CRIG to train over 500 extension agents who, in turn, are training Ghanaian cocoa farmers on the best on-farm practices to achieve great flavor and protect Ghana’s market position. In 2019, the CRIG sensory training program and lab will expand with the installation of bean-to-bar production equipment that will be able to produce thousands of samples for farmers and cooperatives across the country so they can taste for themselves the impact they can have on cocoa and chocolate flavor and value. Guittard’s partners in Ghana helped them set up a similar lab and training program for their sister cocoa-producing country at Ivory Coast’s Centre National de Researche Agronomique (CNRA). John Kehoe, Guittard’s director of sustainability, traveled to Ivory Coast in September 2018 with cocoa processing equipment for their lab to expand this critical WCF/USAID work to the world’s largest cocoa-producing country. Ongoing training, the development of new partnerships, flavor-based research, and farmer extension will add important skills and knowledge to unlock value within the Ivoirian cocoa sector. Indonesia has a rich cocoa-growing tradition with genetics dating from the 1500s and ranks third in the world in cocoa bean production behind Ivory Coast and Ghana. Unfortunately, Indonesia’s cocoa quality does not reflect this unique history and in recent years, cocoa production has contracted due to disease pressure and cocoa farmers switching to other crops. 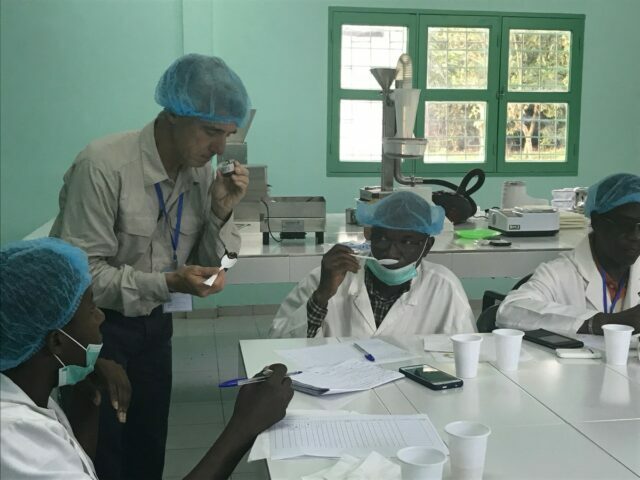 In partnership with the Indonesia Coffee Cocoa Research Institute (ICCRI), Swisscontact and the Millennium Challenge Account, Guittard led the effort to install a flavor lab in December 2017 along with continued sensory training both on-site and via Skype. These new tools and skills are allowing ICCRI and Indonesia to recognize, assess and celebrate the quality and diversity of flavor inherent in Indonesian cocoa and to access new markets. Learn more about Guittard’s Cultivate Better sustainability work at: Guittard.com/cultivate-better.